You have no idea what stories you’re walking into when you approach a monument on the street. 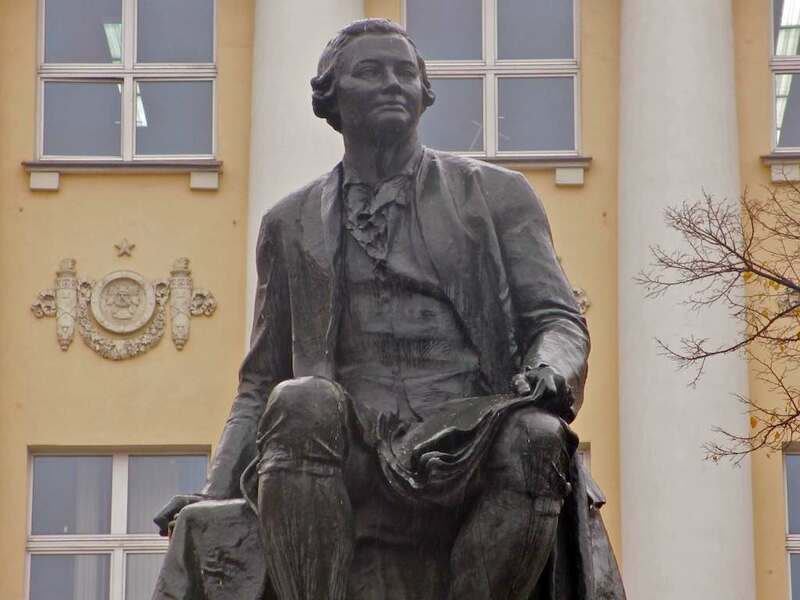 The one I highlight today honors the great Mikhail Lomonosov (1711-1765), Russia’s first everything in the arts and sciences. 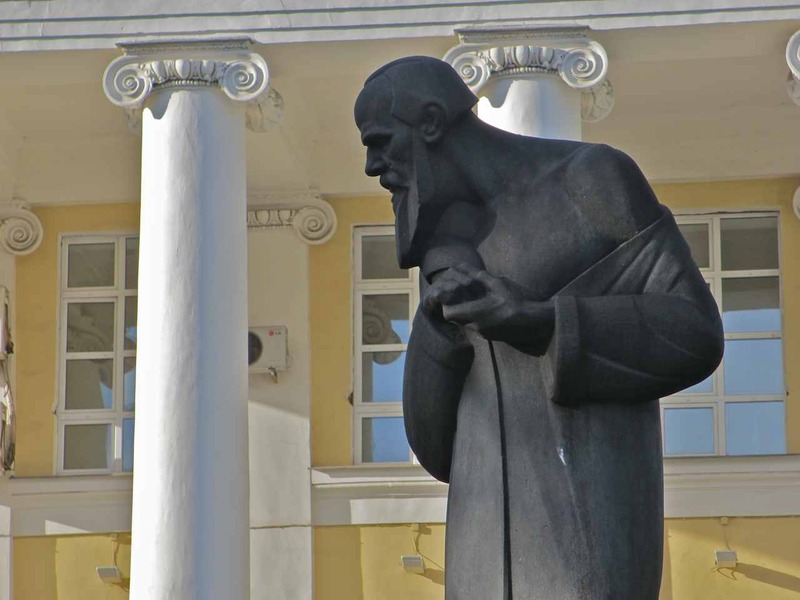 He was essentially the first poet of any consequence, playwright, translator, scientific experimenter, chemist, physicist, astronomer, geologist, metallurgist… He studied in Kiev, Moscow, St. Petersburg, Marburg and Freiburg, to name a few places. 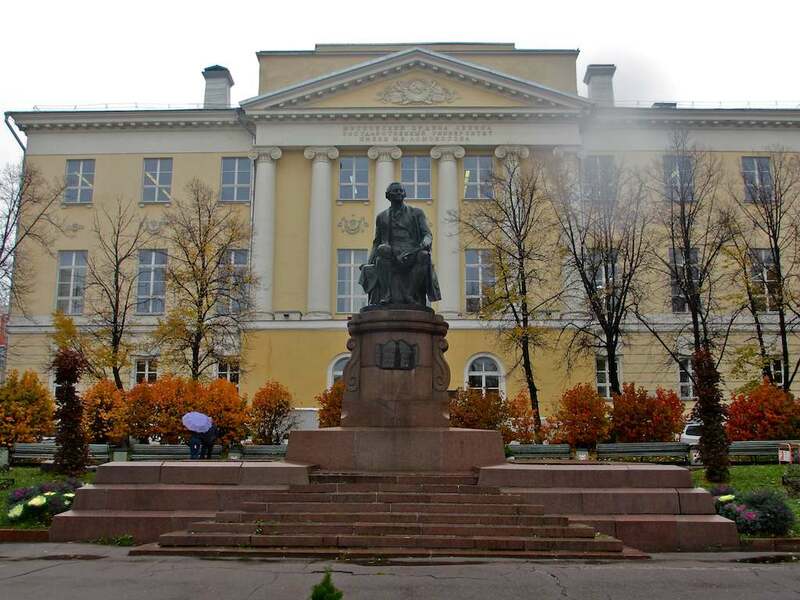 In 1755 Moscow University was established according to Lomonosov’s plan. That’s all pretty well known. 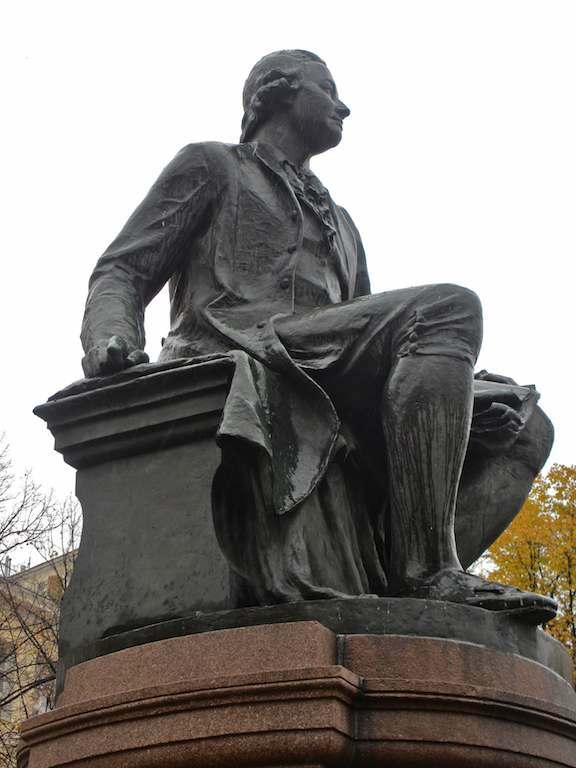 A few of us who studied Lomonosov’s plays and poems have had a laugh or two, let’s be honest. But then if we’re going to be honest, let’s also be fair: How many of those who have laughed singlehandedly established the literary and scientific groundwork for an entire nation? Yeah, right. Now go and laugh some more if you can. 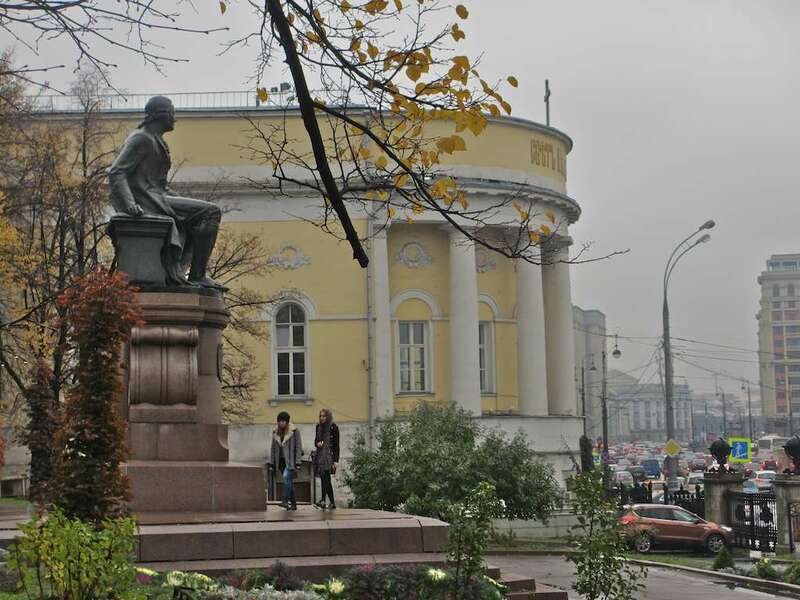 What I, at least, had no inkling of is that the monument to Lomonosov which now stands before the old building of Moscow State University on Mokhovaya Street just across from Red Square and the Kremlin, is the third to grace this space. 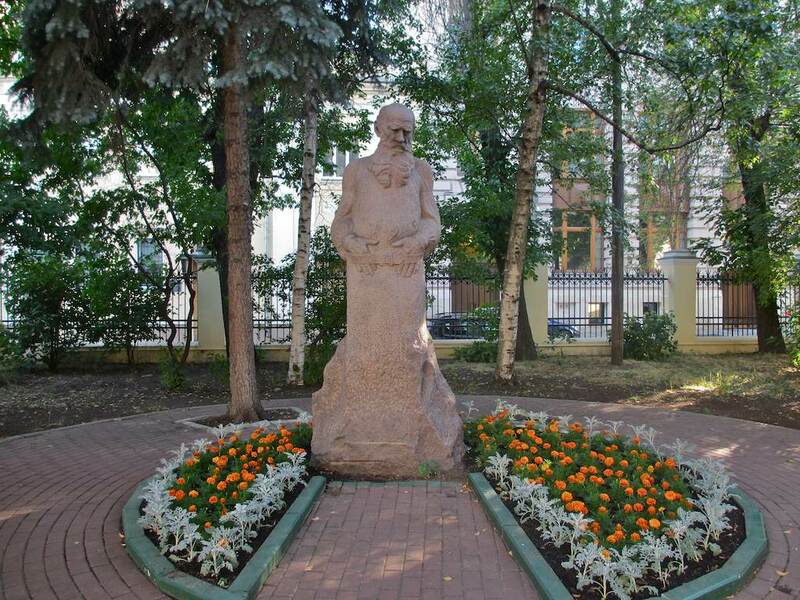 The first was a small bronze bust by Fedot Shubin which was unveiled in 1877 (1876 Old Style). This bust, however, was damaged badly in 1944 during World War II when it was struck by shrapnel from a bomb. 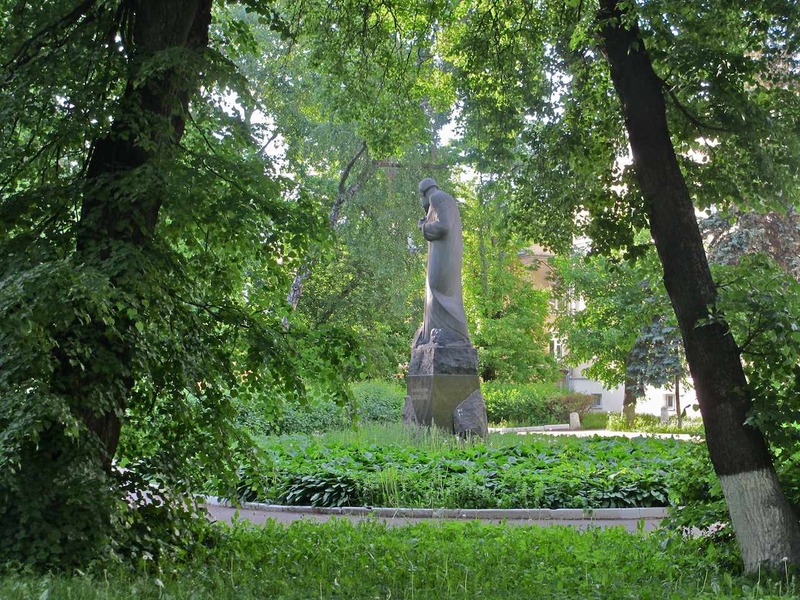 It was decided in 1945 to commission the prominent sculptor Sergei Merkurov to replace the bust with a larger statue. He did so, but, for reasons as yet unclear to me, he employed a temporary plaster or gypsum painted to look like bronze. 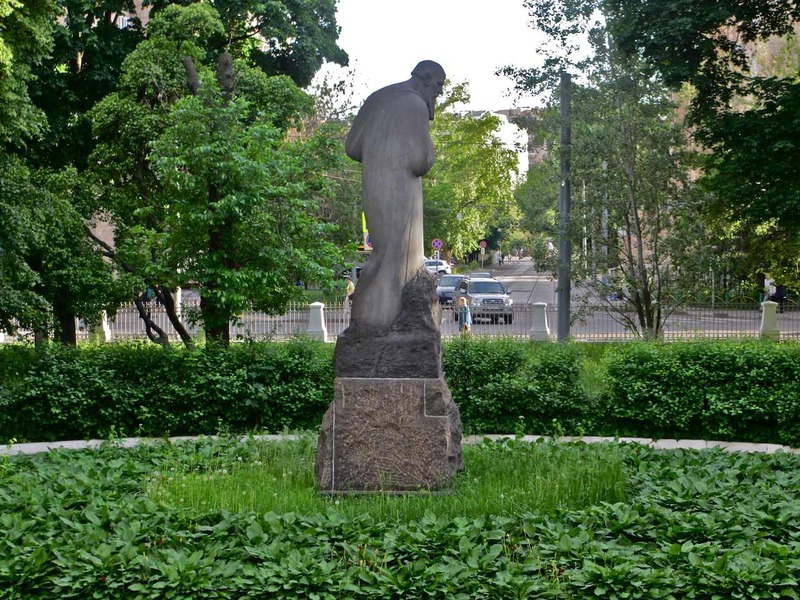 As a result, by 1957 his statue had to be replaced, thus bringing us to the work we now see when we walk onto the grounds of Moscow University in the city center. This image is of a young Lomonosov, perhaps still a student himself. 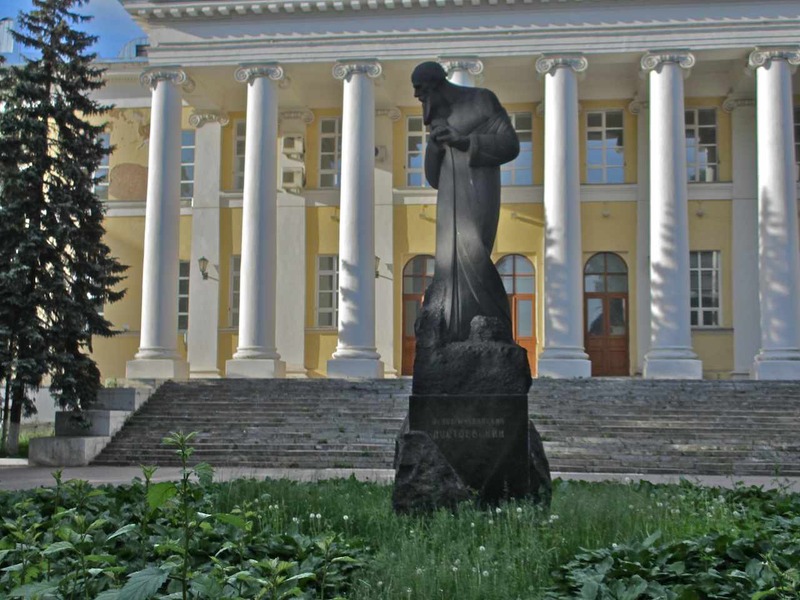 It was sculpted by Iosif Kozlovsky. I have garnered most of this information from several pages on Russian Wikipedia. A little more leisurely research turns up more interesting tidbits. It seems that our poet and scholar had a hot temper and was not averse to a round or two of fisticuffs. 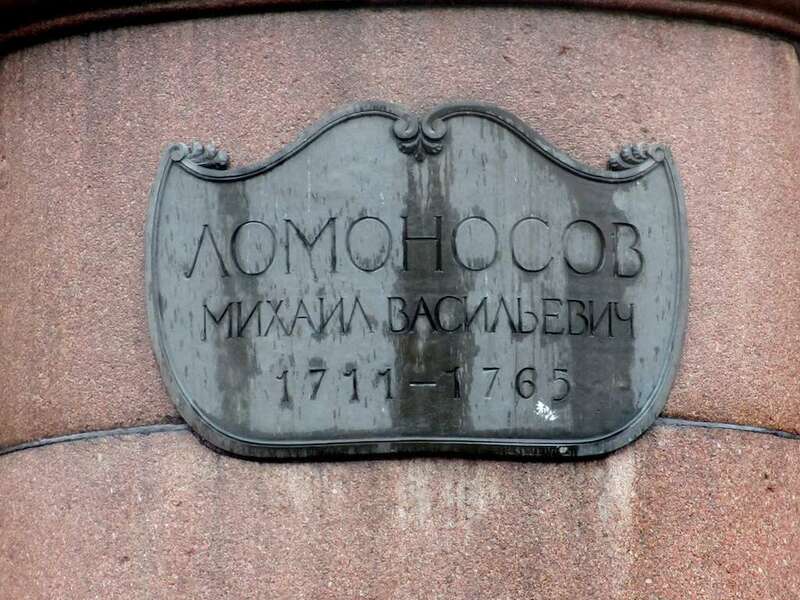 According to an article in the newspaper Arguments and Facts, Lomonosov was once even tried and jailed shortly for fighting. One example of his physical strength and willingness to use it has become something of a legend. 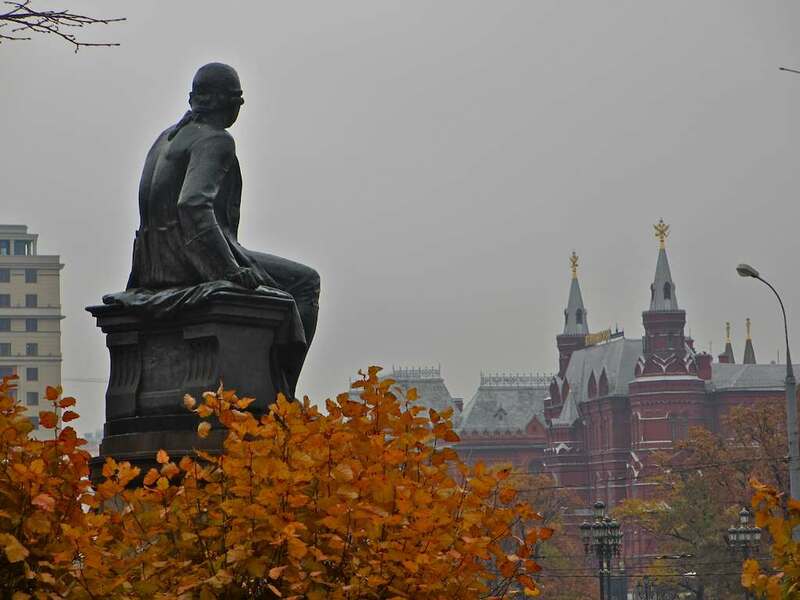 One evening as Lomonosov walked through Vasilyevsky Island in Petersburg he was accosted by three sailors. 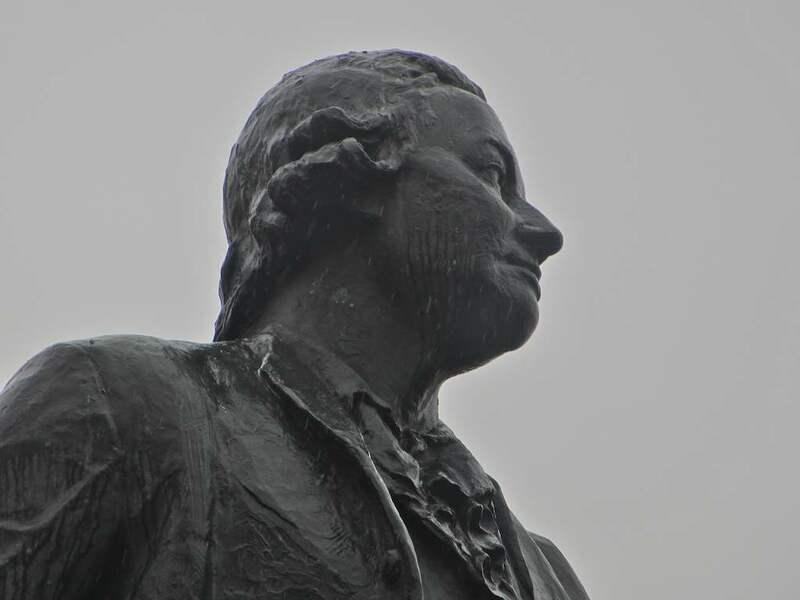 Lomonosov turned on them so furiously that two would-be attackers high-tailed it immediately. The third had the misfortune to land in Lomonosov’s grasp and was splayed out on the street under the learned man’s heavy hand. 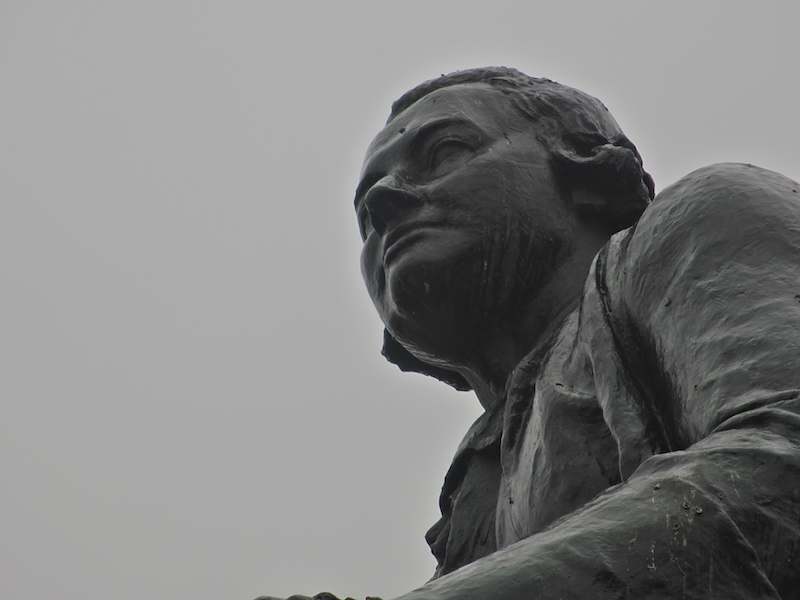 “What are the names of those two bandits, and what did you intend to do to me?” Lomonosov demanded of his captive. The answer quickly followed that robbery was the intent. “You rapscallions, you!” Lomonosov thundered, “Then I will rob you!” And he proceeded to strip his attacker-turned-victim of his clothes and took them home as a trophy of his exploit. Tell me this: How many countries can claim that their first poet, scientist and learned man was also a champion street fighter? You could say I was 43 years in getting here. 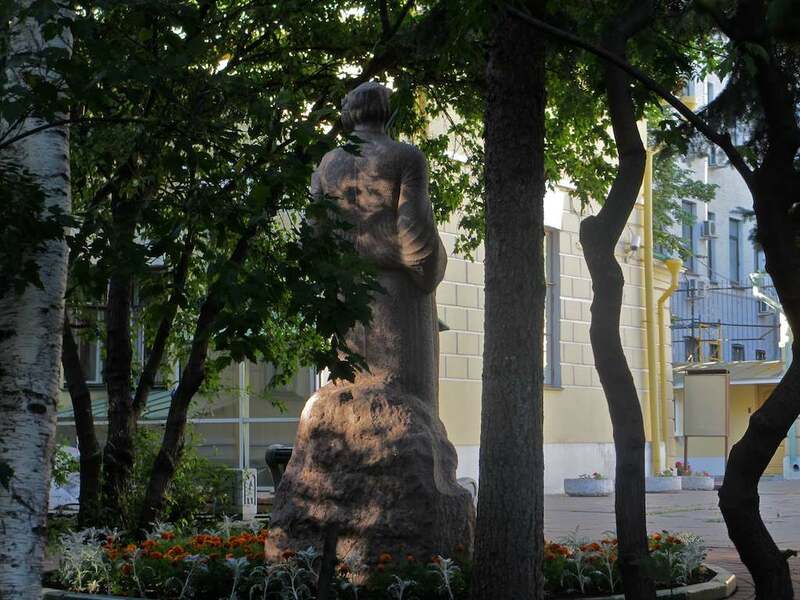 And I felt the weight of all those years one recent early evening as I was walking around the Arbat/Prechistenka region of Moscow, arguably, one of the city’s most beautiful. You see I first encountered Leo Tolstoy in late 1971. 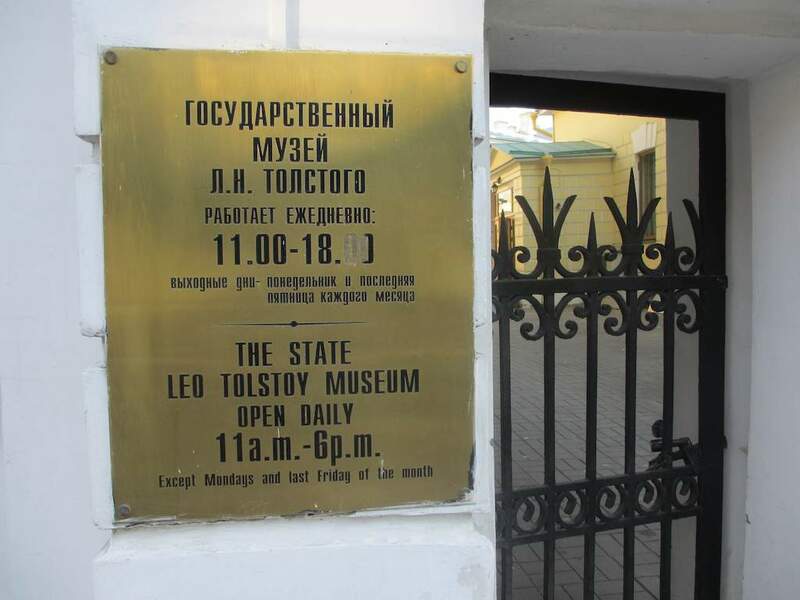 I’ll tell that story in a minute, but what I want to say right now is that, although I’ve lived in Moscow since 1988, I, for some reason, have never been to the Leo Tolstoy Museum. 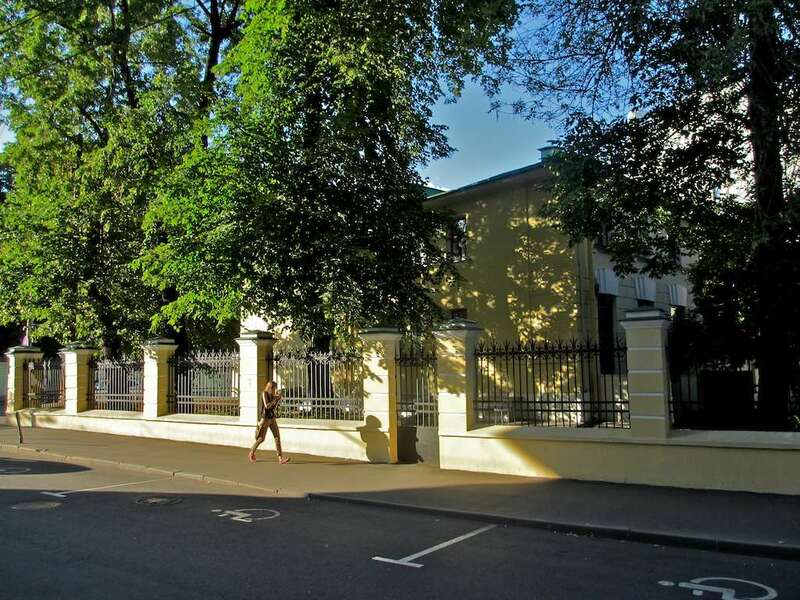 There are actually three or even four in Moscow, God love ’em, but this is the main one, at 11 Prechistenka Street. I came upon the building for the first time ever on foot. I’ve driven by countless times, thinking each time I must one day come here. And then life would interrupt. 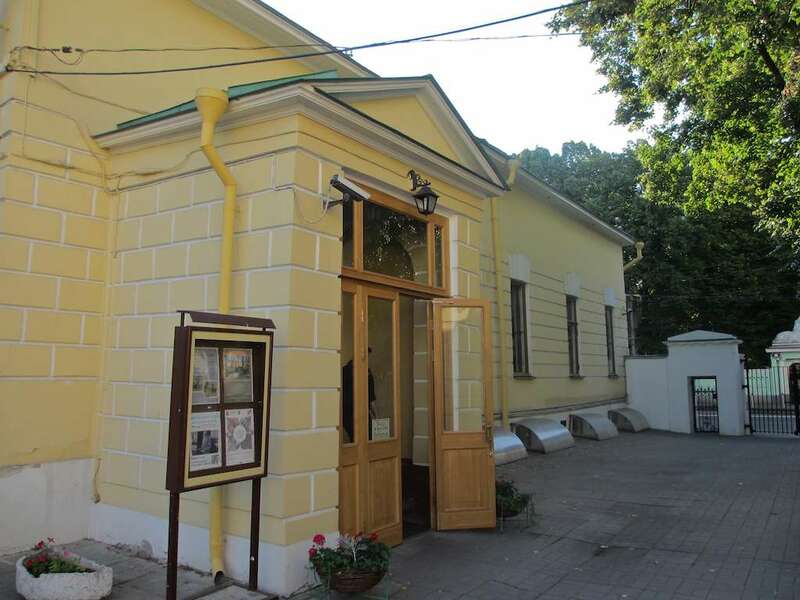 But here I was, walking along and there it was – the Tolstoy museum. I walked around it warily, like one might when finally discovering a treasure you’ve been after forever and now you’re afraid to put out your hand because it might be an illusion and disappear right before your eyes. It also seemed like there was something inadequate about the whole, sudden process that was going on inside me. To put it bluntly, where were the fireworks? 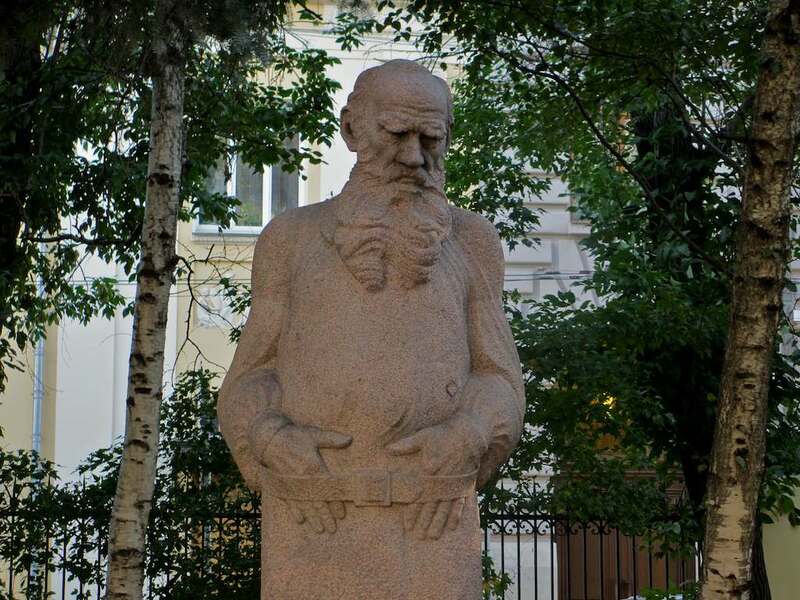 So, rather than going in right away, I walked around the building several times, looking in through a wrought iron fence at the back of a statue that was clearly an image of Tolstoy. Looking at the walls, looking at the grounds. I walked up and down in front of the building’s facade, crossing back over the street to photograph it. I kept trying to find reasons that I belonged here, but I couldn’t. The place, beautiful as it is, kept slipping through the fingers of my mind, if you will. Finally, I saw a woman walk through the gate into the courtyard and I thought, why don’t I do that too? And I did. And I was inside the grounds. 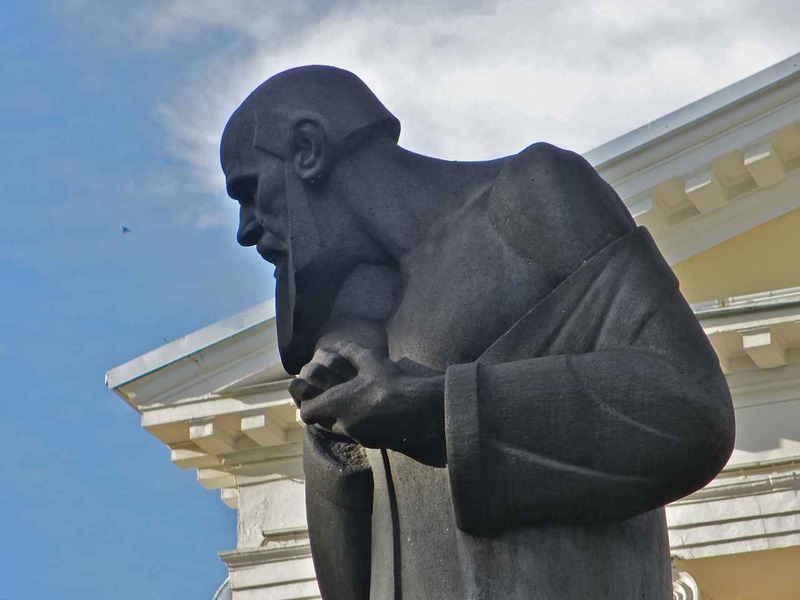 I walked past the open door to the museum itself because I was, at that moment, fixated on seeing the statue, which I could only see from behind from the street. Statues can have a very strong effect on those who encounter them. They can fool you into thinking you are encountering the real thing. 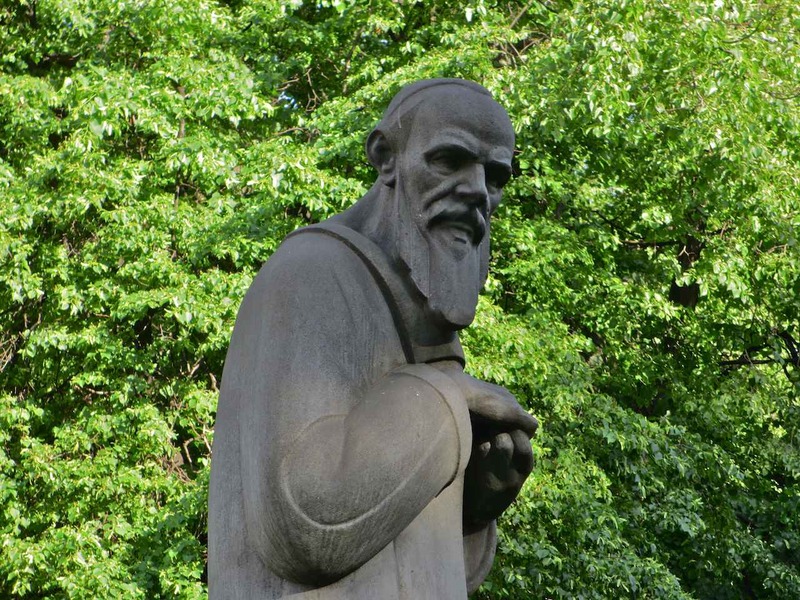 I wanted to encounter Tolstoy. Before I could get there, however, a man in a black uniform came out of the museum and started shouting at me. “Where are you going?! We’re closed!” I ignored him and kept walking towards Tolstoy. The man grew angier and shouted louder, following after me now. “You can’t come in here! We’re closed! Leave now!” he barked. 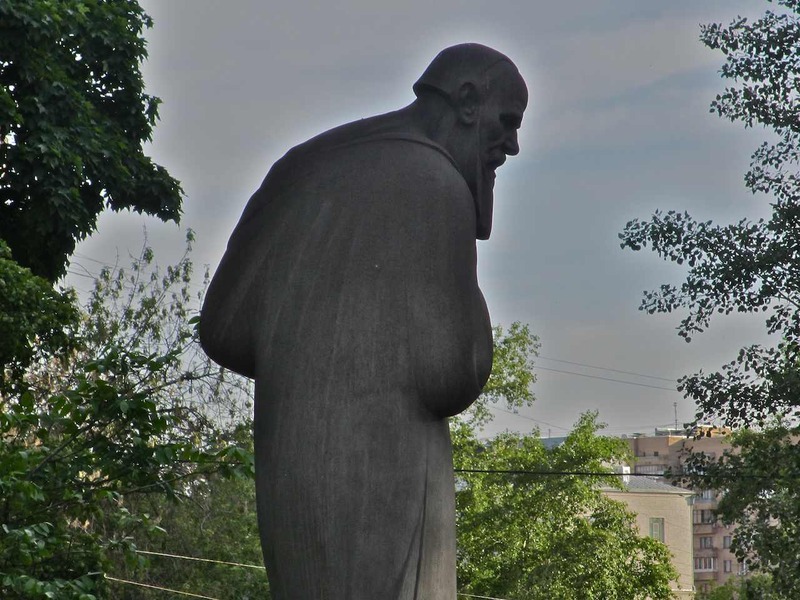 Loudly enough so that I hoped he could hear me I muttered, “Lev Nikolaevich will forgive you!” and I kept walking towards the statue, which I succeeded in photographing twice before I, indeed, had to leave. Frankly, that was what had been missing for the 15, 20 minutes that I worked up the nerve to pay the great writer a visit. 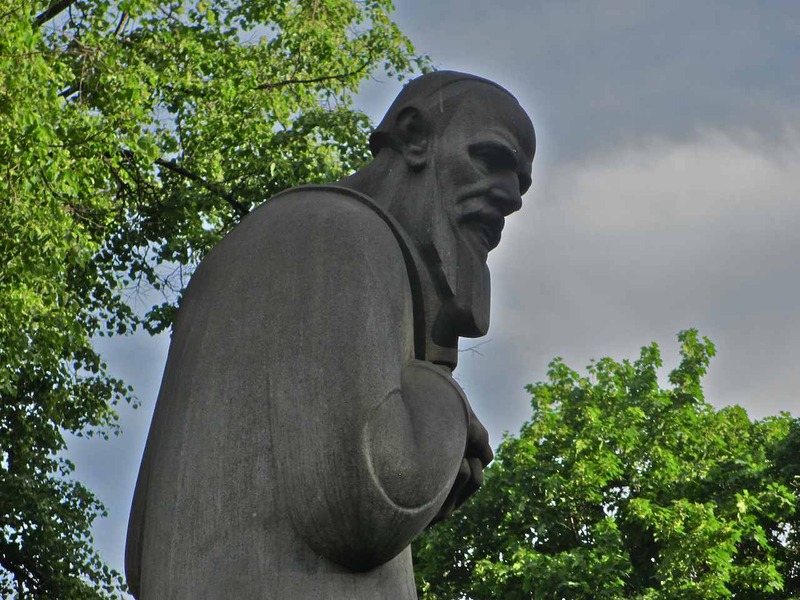 I needed a little bit of an obstacle to overcome and I needed something that united me with Tolstoy against everything and everyone else around me. That grumpy guard did it, although I can’t say I feel the gratitude for him that I perhaps ought to. Authority figures irritate me. 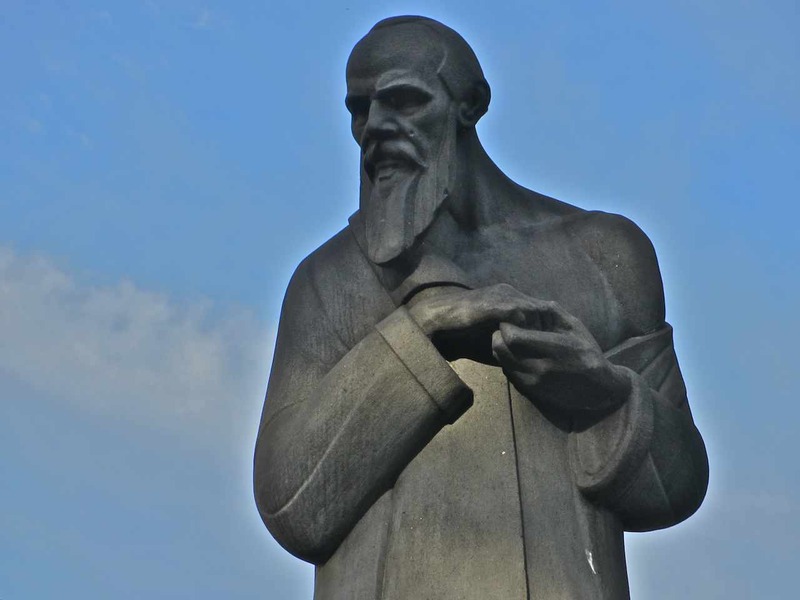 Authority itself, like that which Tolstoy commands, does not. But those “figures,” those “authority figures” – man they get under my skin. 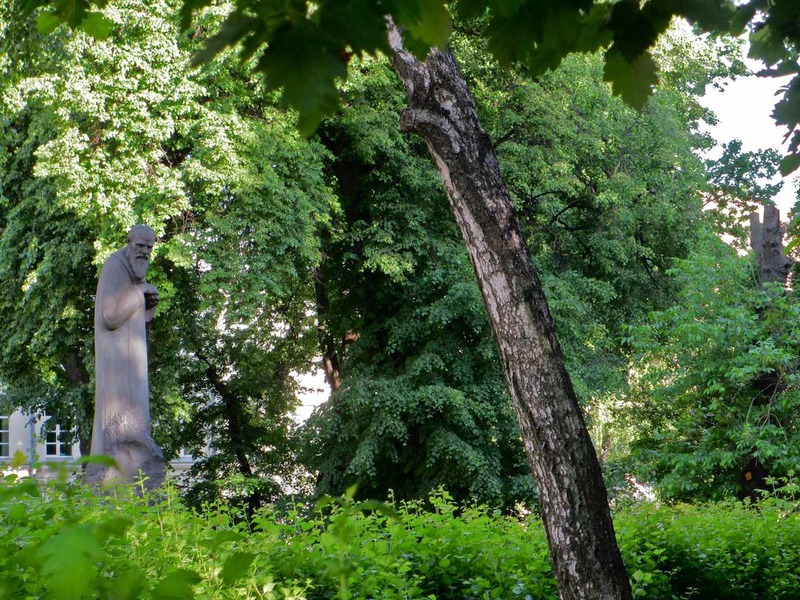 Okay, the tale of finding Tolstoy in 1971. I’ll try to do this as painlessly as possible. I was in my final year of high school. For my English studies I was enrolled in a free form class that allowed the students to follow their own muse. We had a brilliant teacher, Dorothy “Dottie” Shamah, who knew exactly how much rope to give a young, arrogant high school kid before he hung himself. So when she explained in September that there was no curriculum and that we all would make the class happen ourselves with our independent reading and discussions, I apparently sensed a tremendous opportunity. I say “apparently” because I don’t know this for a fact. Not only do I not remember, but I doubt I understood anything of it at the time. My point is this – my best friend Clete (who was also in the group) and I gratefully used class time every Friday to go climbing in the mountains that rose up behind our homes. To this day I think those hours spent forging streams, climbing trees, hiking up steep crevices and clambering over mountain rocks taught me more than I had learned up until that point in my life in all my 11 years of schooling. It taught me danger, it taught me fearlessness, it taught me exploration, it taught me stupidity, it taught me luck (like the time we got running downhill so fast that the only way we could stop was to throw our bodies on the ground and when we came rolling and bouncing to a stop our legs were hanging over the edge of a towering cliff), it taught me teamwork – together Clete and I got out of every tight spot we got ourselves into. It taught us the value of disobedience and it brought us around to a sensation of responsibility. The mountains behind Claremont, CA, taught me all that, but they only did so because I was cutting Dottie Shamah’s Friday English class all the time. The fact that it was “stolen” time made it incredibly valuable. But I did say “responsibility” here a moment ago, and Clete and I would occasionally deign to visit classes. On those occasions, so generous on our part, Dottie was her usual self, unperturbed, sanguine, and non-judgmental about the actions of her wayward students. I don’t know why I said War and Peace. I don’t know how or why I knew it was a big book. But it came to me from somewhere. And that’s what I said. I said I was reading War and Peace. Do you realize what a brilliant teacher Dottie Shamah was? She didn’t say the whole book, she said the first half. It was her little way, instinctive, surely – the instincts of a great teacher – of letting me know that she knew I wasn’t reading any War and Peace at all and that I didn’t have the vaguest notion of what it was or why I had said it. She let me know that and she let me get away with it. Well, sort of – I mean reading half of War and Peace in a week isn’t easy, but it’s doable. Reading the whole thing would have been punishment. But she wasn’t interested in punishing me for being bad or for lying, she wanted me to learn something from this moment, from every moment that had led up to it, and from each which would flow outward from it now. That, essentially, is the story. To put it simply, after that moment my life changed. Everything that followed is the life I have lived. 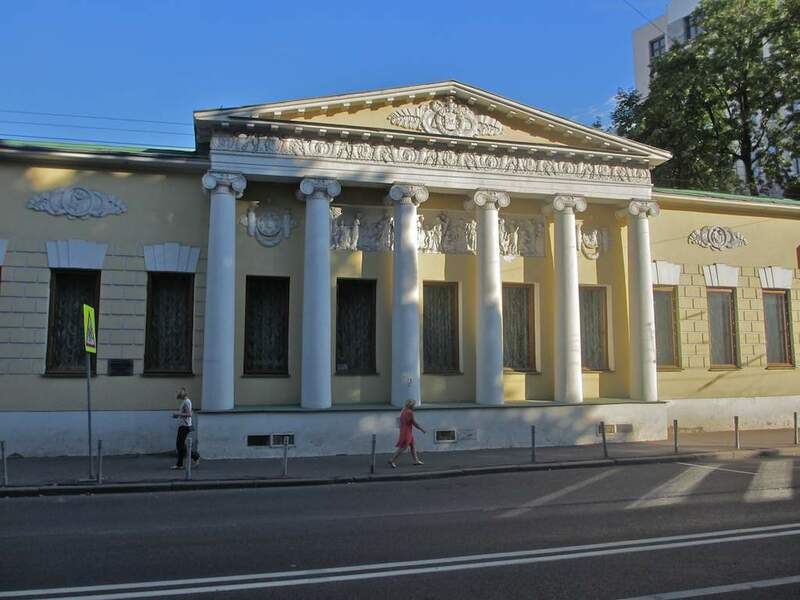 So when I say I was 43 years in getting to the museum at 11 Prechistenka, I mean exactly what I say. A few words of wrap-up. 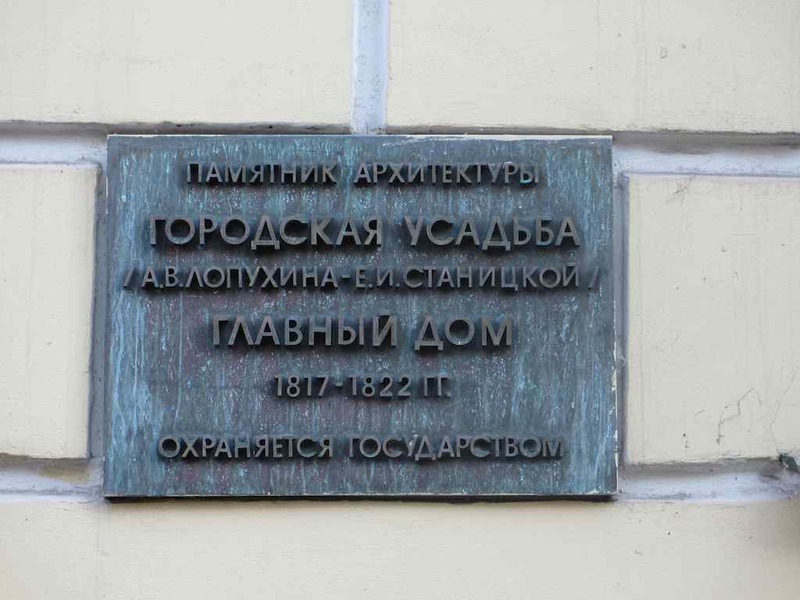 Tolstoy never lived at this address. 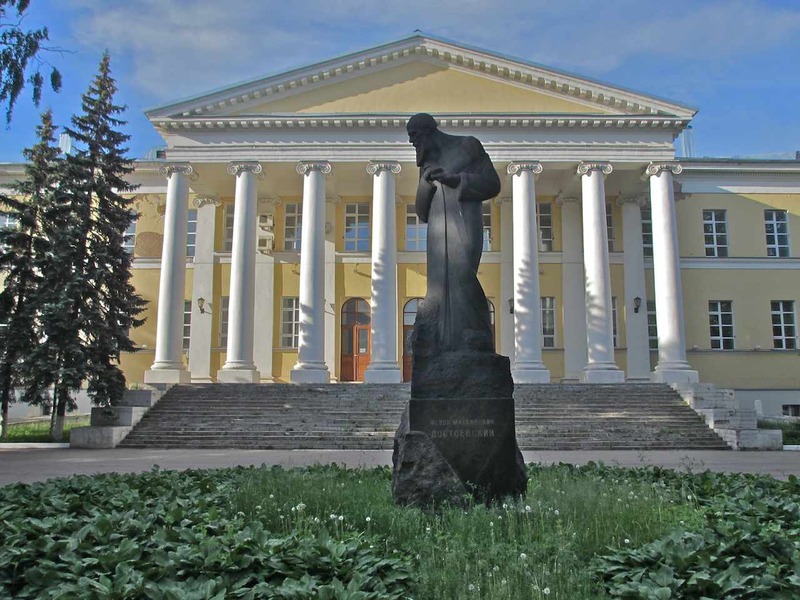 It was chosen to be the main seat of the chain of Tolstoy museums because it looked like the Moscow of the War and Peace era. I didn’t know that until I looked it up in order to write this blog. And that struck me. It makes sense then that I wasn’t making contact with this place when I first approached it. The aura was missing. 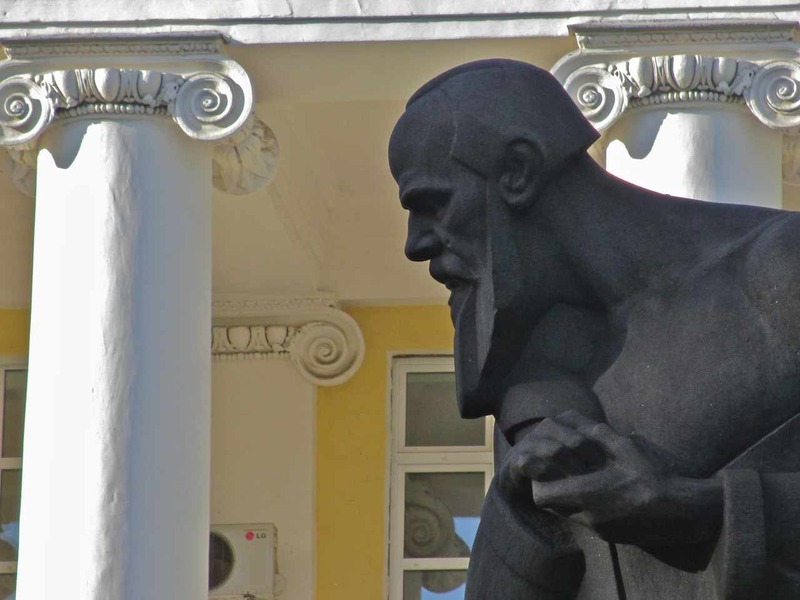 That nasty guard and Sergei Merkurov’s statue out back helped me overcome that. 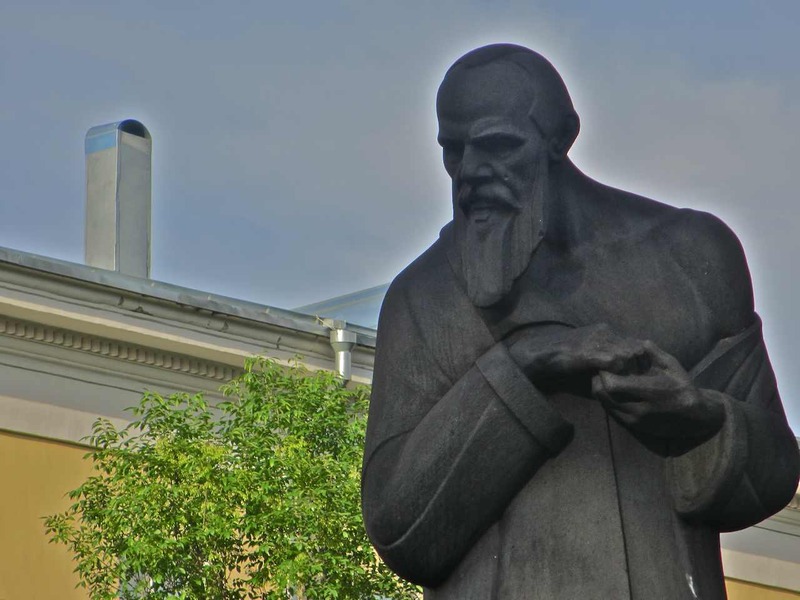 But the absence of a real-life connection to Tolstoy was true – there is none. As for the nasty guard, you can sort of see him in the photo below, preparing to come kick me out. I’m pleased that he has no face. He’s lost to history.